I know i will not recieve another free gift, but i had to comment on my purchase. My wife loves this ring. She still stares at it from time to time and tells me how much she loves it. She is always commenting about people who tell her how pretty it is. 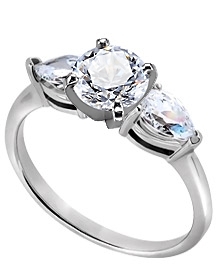 This classic 14k white gold 2 mm engagement ring is prong set with two matched pear shaped diamonds. Each has an approximate weight of .33 carat with a color of G-H and a clarity of SI. One diamond is set on each shoulder for a total carat weight of .66 carat.